A dangerous driver was removed from a busy roadway in western Iowa over the weekend. According to the Iowa State Patrol, the motorist was clocked at 97 miles per hour on Interstate 29 near Council Bluffs. 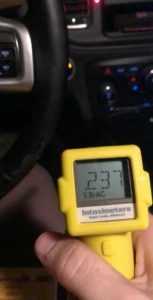 In addition, the driver was given a breathalyzer test and registered a .237 blood alcohol level. That’s nearly three times the legal limit to drive.